Heat the oil in a pan and sauté the tomato and chopped garlic. Add the finely-chopped jalapeño, seeds removed. Add the ground meat and season with salt, pepper, and cumin, mixing all the ingredients well. Add the potato to the pan and cook until the potato is tender and the meat is lightly brown. Heat a hotplate or a pan and place the tortillas on top. Cover half of each tortilla with a good amount of shredded cheese and add the picadillo. Fold the other half of the tortilla and close the quesadillas, adding pressure with a spatula. Allow the tortillas to toast a little on each side and the cheese to melt completely. You can add other vegetables to the picadillo, like carrots or peas. 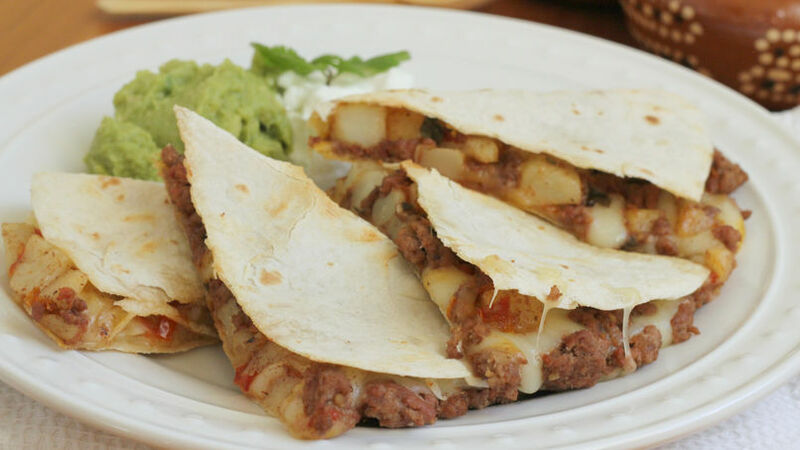 These picadillo quesadillas are a good bet when you want a meal that's both quick and delicious. Be sure to add a generous amount of cheese and serve with hot sauce, or simply with guacamole and sour cream. You can prepare an extra serving of this delicious picadillo to serve it during another occasion. It goes well with everything: white rice or bread, even with corn tortillas, like a taco. Doesn't that sound like a good idea for dinner tonight?